Banglalink 9 MB 3 TK Internet Package is the Mini Internet Pack for the Mobile Internet users. If you are Mobile Internet users, you can use this Pack to Browse Facebook or Check Email or others. The Pack is a Cheap Rates Banglalink Internet Pack. If you are looking for this Pack, Just Read the below Conditions, Price with VAT, SD, SC Charge and Activation System and Finally Activate the Package through USSD Code. To activate Banglalink 9 MB 3 TK Internet Offer, Interested Customers need to Dial *5000*513#. All kinds of Tax is including in 3 Taka. The validity of Banglalink 9 MB Internet Offer 1 days and internet starts on after receiving a confirmation message. To check Banglalink remaining internet balance, Dial *5000*500#. If the 9MB Internet Volume end, The Customer will be charged 1paisa/10KB and internet speed will be reduced to 128kbps to protect you from bill-shock. To Deactivate or Stop the 9 MB Internet 3 TK Offer, customers need to Dial *5000*536#. 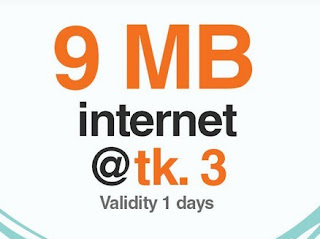 Need more info about Banglalink 9 MB 3 TK Internet Package? If yes, just Call to the Banglalink Helpline and get the necessary Information. You can also make a comment in the below Comment box. We will provide you exact Information as soon as possible. Thank you for stay with us with your Valuable time. Have a Nice Browsing!